Describe the effects of the magnetic force between two conductors. Calculate the force between two parallel conductors. You might expect that there are significant forces between current-carrying wires, since ordinary currents produce significant magnetic fields and these fields exert significant forces on ordinary currents. But you might not expect that the force between wires is used to define the ampere. It might also surprise you to learn that this force has something to do with why large circuit breakers burn up when they attempt to interrupt large currents. Figure 1. 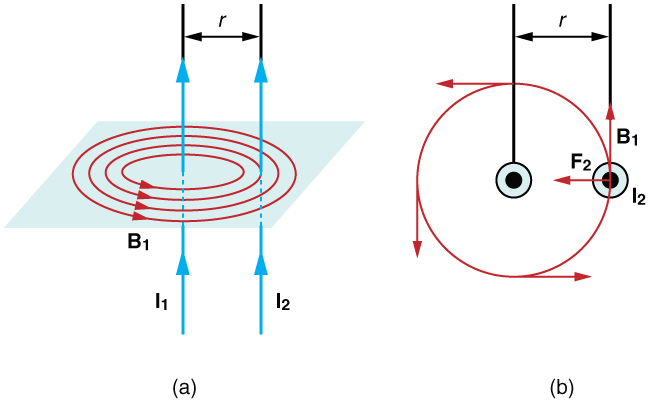 (a) The magnetic field produced by a long straight conductor is perpendicular to a parallel conductor, as indicated by RHR-2. (b) A view from above of the two wires shown in (a), with one magnetic field line shown for each wire. RHR-1 shows that the force between the parallel conductors is attractive when the currents are in the same direction. 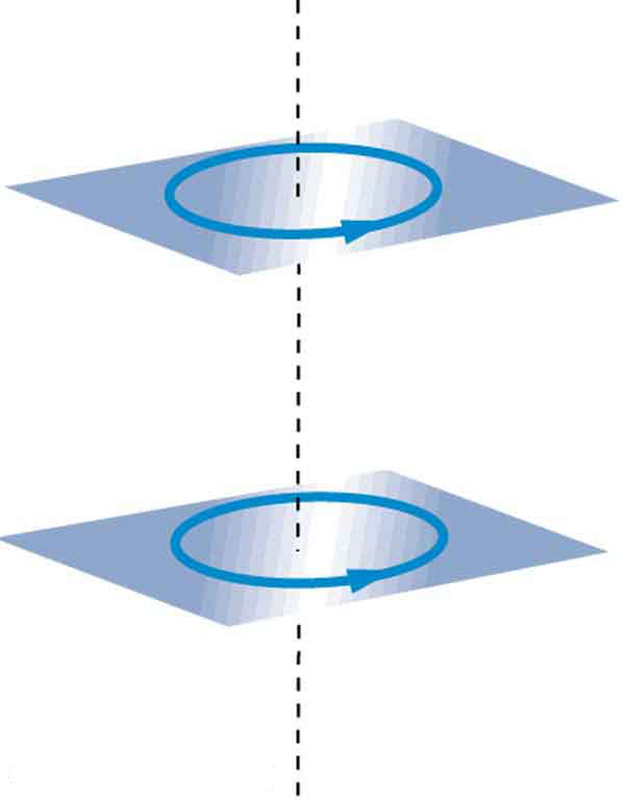 A similar analysis shows that the force is repulsive between currents in opposite directions. 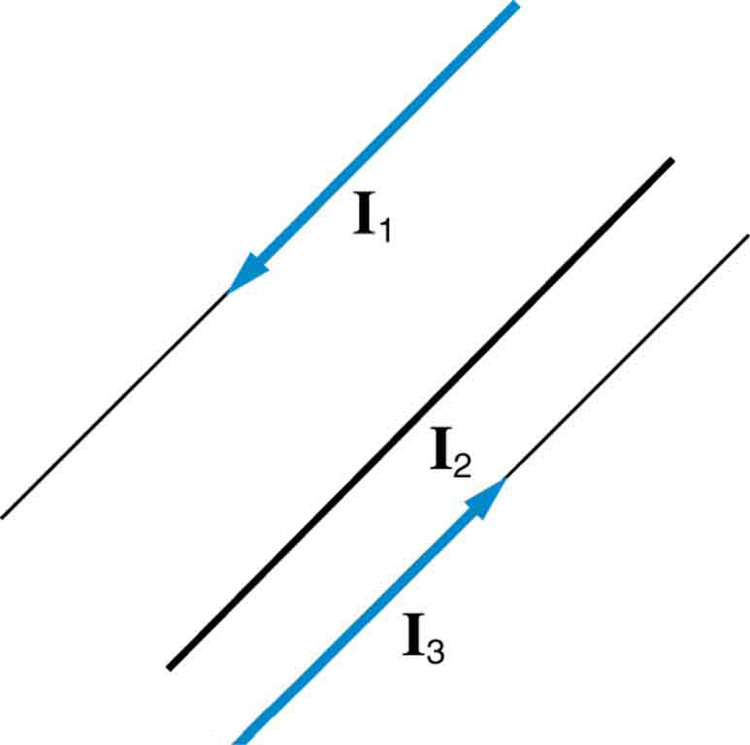 is the force per unit length between two parallel currents and separated by a distance . The force is attractive if the currents are in the same direction and repulsive if they are in opposite directions. This force is responsible for the pinch effect in electric arcs and plasmas. The force exists whether the currents are in wires or not. In an electric arc, where currents are moving parallel to one another, there is an attraction that squeezes currents into a smaller tube. In large circuit breakers, like those used in neighborhood power distribution systems, the pinch effect can concentrate an arc between plates of a switch trying to break a large current, burn holes, and even ignite the equipment. Another example of the pinch effect is found in the solar plasma, where jets of ionized material, such as solar flares, are shaped by magnetic forces. Since is exactly by definition, and because , the force per meter is exactly . This is the basis of the operational definition of the ampere. One ampere of current through each of two parallel conductors of infinite length, separated by one meter in empty space free of other magnetic fields, causes a force of exactly on each conductor. Infinite-length straight wires are impractical and so, in practice, a current balance is constructed with coils of wire separated by a few centimeters. Force is measured to determine current. This also provides us with a method for measuring the coulomb. We measure the charge that flows for a current of one ampere in one second. That is, . For both the ampere and the coulomb, the method of measuring force between conductors is the most accurate in practice. The force is attractive if the currents are in the same direction, repulsive if they are in opposite directions. 1: Is the force attractive or repulsive between the hot and neutral lines hung from power poles? Why? 2: If you have three parallel wires in the same plane, as in Figure 2, with currents in the outer two running in opposite directions, is it possible for the middle wire to be repelled by both? Attracted by both? Explain. Figure 2. Three parallel coplanar wires with currents in the outer two in opposite directions. 3: Suppose two long straight wires run perpendicular to one another without touching. Does one exert a net force on the other? If so, what is its direction? Does one exert a net torque on the other? If so, what is its direction? Justify your responses by using the right hand rules. 4: Use the right hand rules to show that the force between the two loops in Figure 3 is attractive if the currents are in the same direction and repulsive if they are in opposite directions. Is this consistent with like poles of the loops repelling and unlike poles of the loops attracting? Draw sketches to justify your answers. Figure 3. Two loops of wire carrying currents can exert forces and torques on one another. 5: If one of the loops in Figure 3 is tilted slightly relative to the other and their currents are in the same direction, what are the directions of the torques they exert on each other? Does this imply that the poles of the bar magnet-like fields they create will line up with each other if the loops are allowed to rotate? 6: Electric field lines can be shielded by the Faraday cage effect. Can we have magnetic shielding? Can we have gravitational shielding? 1: (a) The hot and neutral wires supplying DC power to a light-rail commuter train carry 800 A and are separated by 75.0 cm. What is the magnitude and direction of the force between 50.0 m of these wires? (b) Discuss the practical consequences of this force, if any. 2: The force per meter between the two wires of a jumper cable being used to start a stalled car is 0.225 N/m. 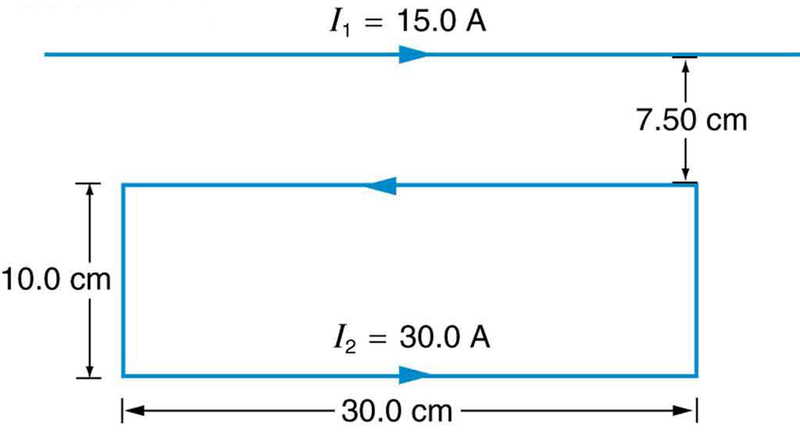 (a) What is the current in the wires, given they are separated by 2.00 cm? (b) Is the force attractive or repulsive? 3: A 2.50-m segment of wire supplying current to the motor of a submerged submarine carries 1000 A and feels a 4.00-N repulsive force from a parallel wire 5.00 cm away. What is the direction and magnitude of the current in the other wire? 4: The wire carrying 400 A to the motor of a commuter train feels an attractive force of due to a parallel wire carrying 5.00 A to a headlight. (a) How far apart are the wires? (b) Are the currents in the same direction? 5: An AC appliance cord has its hot and neutral wires separated by 3.00 mm and carries a 5.00-A current. (a) What is the average force per meter between the wires in the cord? (b) What is the maximum force per meter between the wires? (c) Are the forces attractive or repulsive? (d) Do appliance cords need any special design features to compensate for these forces? 6: Figure 4 shows a long straight wire near a rectangular current loop. What is the direction and magnitude of the total force on the loop? 7: Find the direction and magnitude of the force that each wire experiences in Figure 5(a) by, using vector addition. 8: Find the direction and magnitude of the force that each wire experiences in Figure 5(b), using vector addition. (b) This force is repulsive and therefore there is never a risk that the two wires will touch and short circuit. 22.10 Magnetic Force between Two Parallel Conductors by OpenStax is licensed under a Creative Commons Attribution 4.0 International License, except where otherwise noted.